﻿Harrietville Museum houses a wonderful collection of reports, memorabilia, books and photographs of the history of skiing in this area. Early travelling in the snow was mostly concerned with mail and supply services to small towns between Harrietville and Omeo along a rough road, the Bon Accord track and many hardships were endured. It wasn't until Norwegians who immigrated to Australia's gold fields and introduced 'skiing' as an activity/sport, forming the first Ski Club in Kiandra NSW in 1861, that an interest in 'Skiing' in Australia was born. Harrietville, situated at the base of Mt Feathertop and Mt Hotham became a staging point for ski enthusiasts and clubs from Wangaratta, Albury and Melbourne. In 1906 a track was cut from Harrietville to Feathertop and later a hut, Bungalow was built. It was completely burnt in the 1939 fires and never rebuilt. The Bungalow, built by the Railways Dept on Bungalow Spur could house up to 30 skiers/walkers. 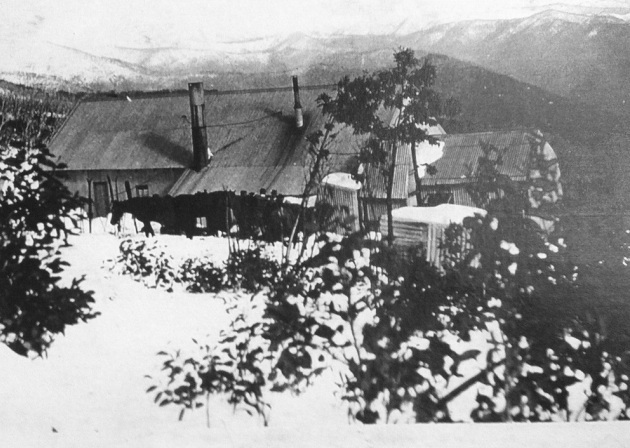 It had bathrooms with hot and cold water and Ada Banks of Mountain View Guest House in Harrietville was known to accompany the skiers by horseback to the snowline. The guests (usually from Wangaratta or The Victorian Ski Clubs) would then release the horses they had hired from the stables in Harrietville who would wander back home. Ada would cook and look after the guests, taking their bed linen in bundles on either side of her horse back down to the Guest House on the final day in time to cook the guests' evening meal before they left to go back home to work.